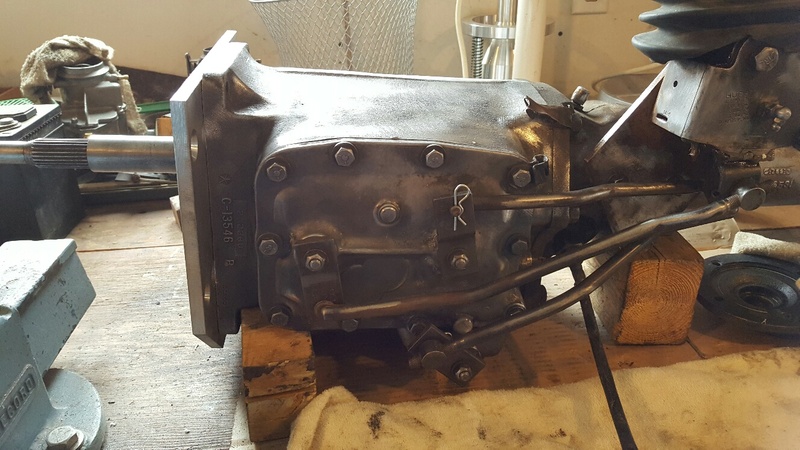 Okay, so here we have a Chrysler Flathead High Performance entry, this will be for all flathead hop up ideas, projects, racing supercharging and turbocharging, heck add in fuel injection or ? 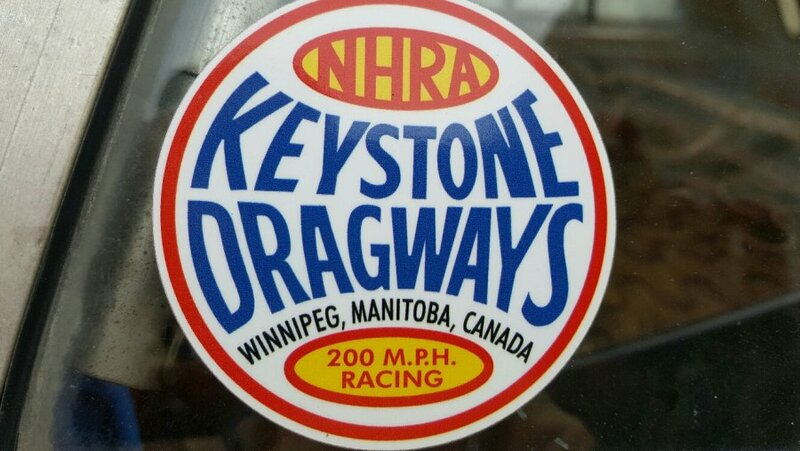 Please post your stories, ideas and pics, all are welcome, but please respect the topic, and stay on topic, disputes, conjecture and non Mopar entries will most likely result in content being deleted, repeat offenders will be barred. 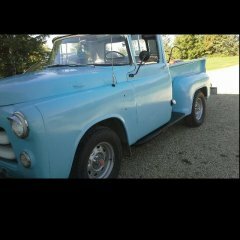 I am currently running a 228 ina 1955 Fargo pickup, T98 a 4 spd and a Mopar 8 1/4d diff with 3.23 gears. 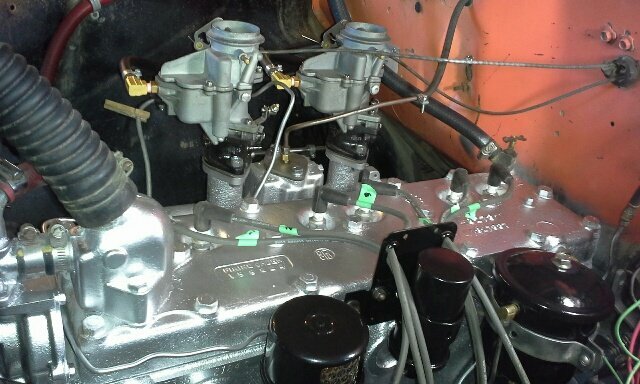 My engine is bone stock, somewhat tired, and is equipped with a AoK Racing cutom built dual carb intake, split exhaust and 2 George Asche built Carter B&B trucks carbs and the linkage all courtesy of Tim Kingsbury. I will post a few pics and videos, and hope some of you do too. My Fargo , after i got it running, and the cab on it, has come a ways.. 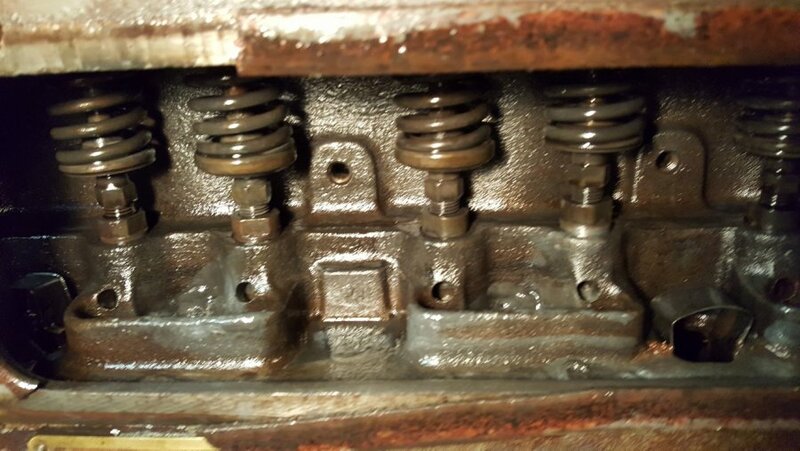 Okay, so not a whole lot of activity on the Chrysler Flathead Hi Perf Engine thread the past few days, was hoping some of the serious and interested types would contribute some content on this thread. 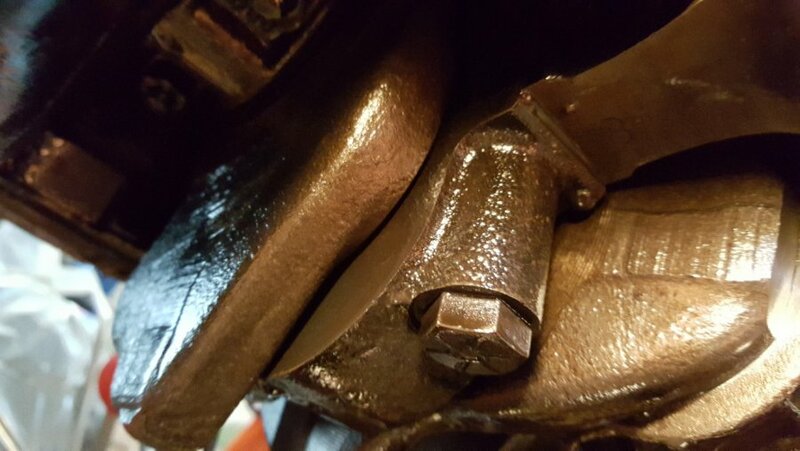 It does not need to be high dollar, and super exotic modified engines, a simple "Head Milling" and split exhaust certainly qualifies. 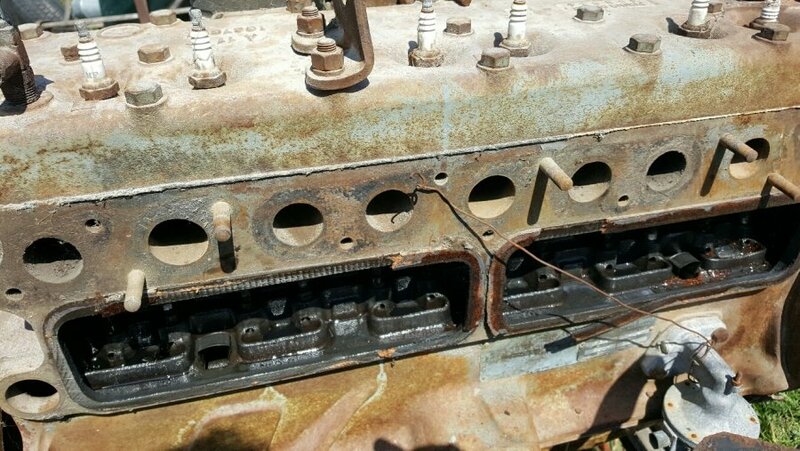 I have come across 2 rebuilt 265 engines the past few days, and will be looking at one as a perspective candidate, and will post pics and updates on what I find. I do won another 265, came out of My Father -in-laws combine, and is a runner too, but still need to get it home, this one is a Chrysler Industrial engine built in 1969. I have no idea what type of cam profile or Combustion Chamber design the Industrial engine many have, but do suspect it is built for a fixed RPM with low RPM torque being the priority. 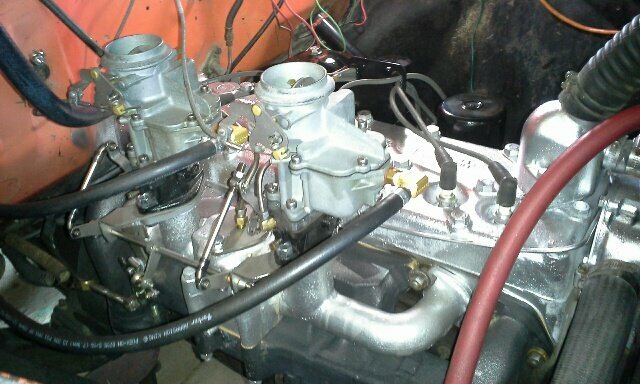 My current engine is a bit tried, a stock 228 CI 3 3/8 bore and 4 1/4 stroke 25 inch block,with a T 335 serial number, and in most likely was never rebuilt. 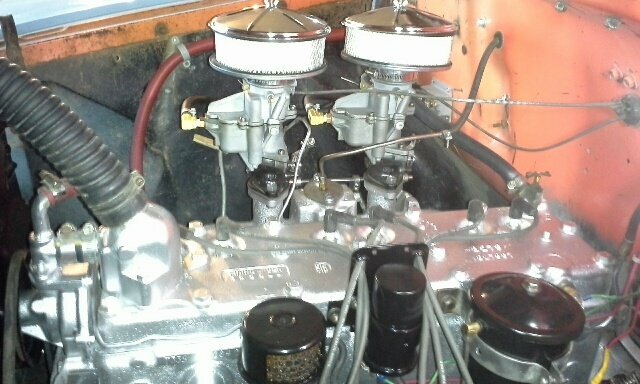 It runs very well, does not burn oil, leaks a bit, has very good oil pressure 55-60 after 35 mph, and 40 psi at idle, on real hot days or when engine good and warm, that might drop to 35 or so at idle. 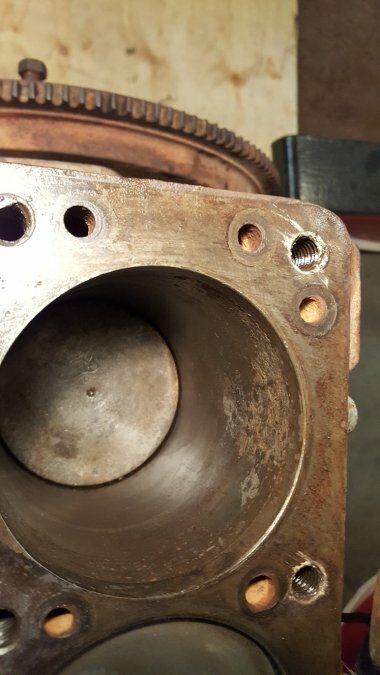 Last night did a compression test, as she is a bit down on power, this is what I found 90-95 psi compression except cyl#4 it has 75 psi, did this wet with 30 weight oil in each cyl, this did not change the test results. 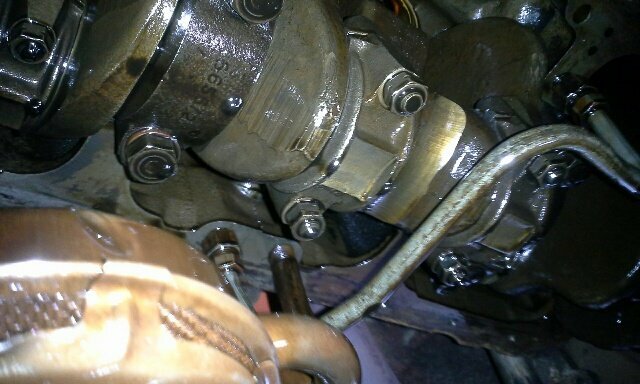 I am no doubt deal with a burnt valve or very poorly sealed ring in hole #4. 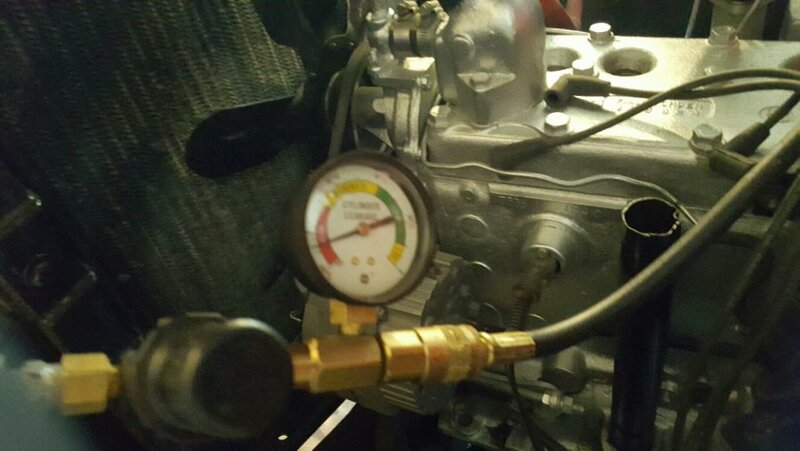 This engine starts well, and runs well for the most parts, so is a bit tired, factory or fresh compression normally on this 7:1 engine would be 110-120 psi, so down a bit. Here are some fairly recent pics of the bottom end, note how clean it is, and evidence of cross hatching can be seen in the cyls. 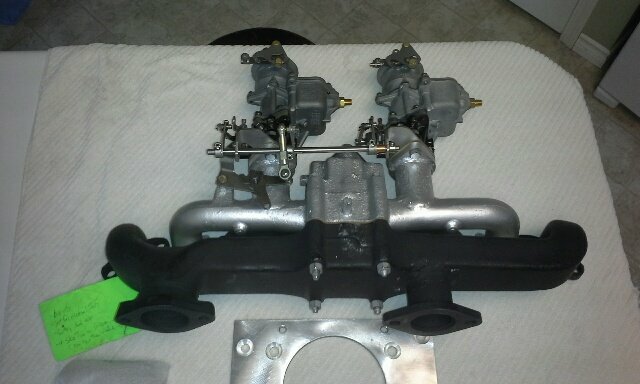 Okay so picked up the engine last Saturday, and hauled it home. 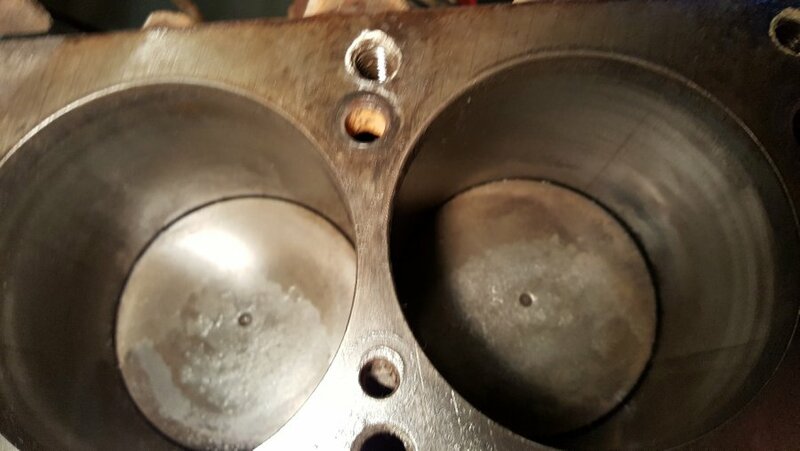 I pulled the head, lots of carbon, and cyl 6 had some moisture o the valves, and the cyl got a little rusted on the top 2 inches. 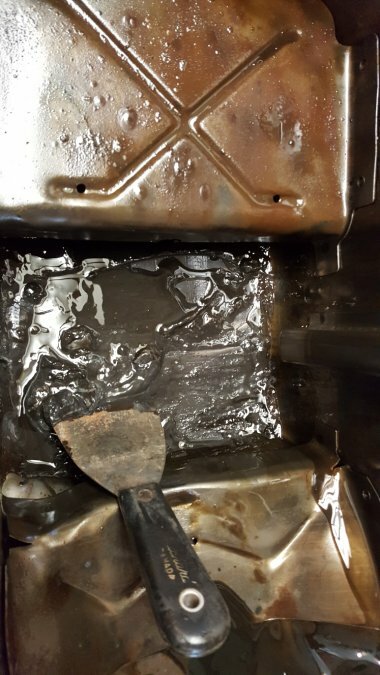 I lceaned up all, and oiled the cyl walls until I get a chance to deal with it. 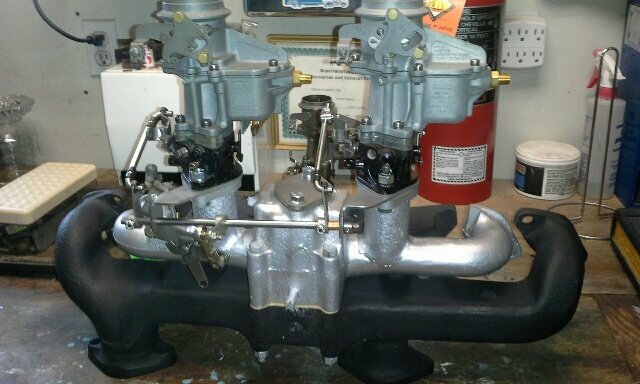 The valve chambers, the valves and top of combustion chambers cleaned up nicely. The underside of head cleaned up too. 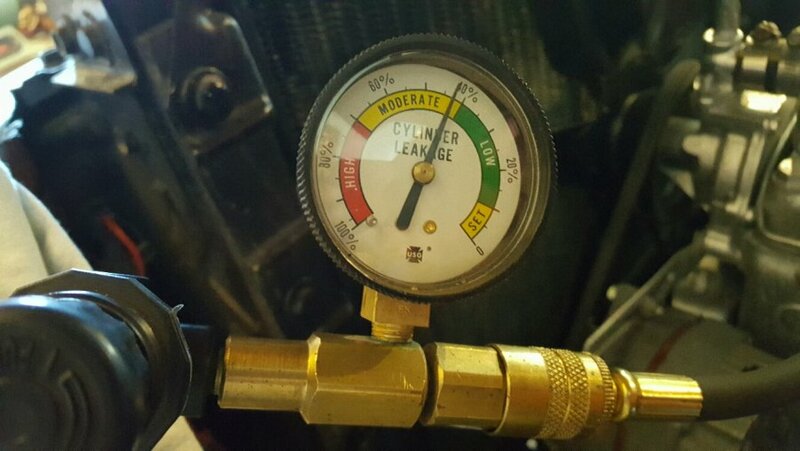 Well its fairly simple on a cam profile for an industrial engine destined for a "combine" low RPM torque, how much different than say a truck profile I do not know. 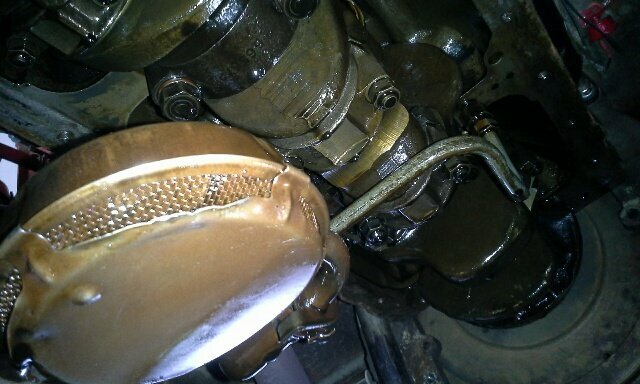 These engines are rated at 95 hp, but at a much lower RPM than 3600. 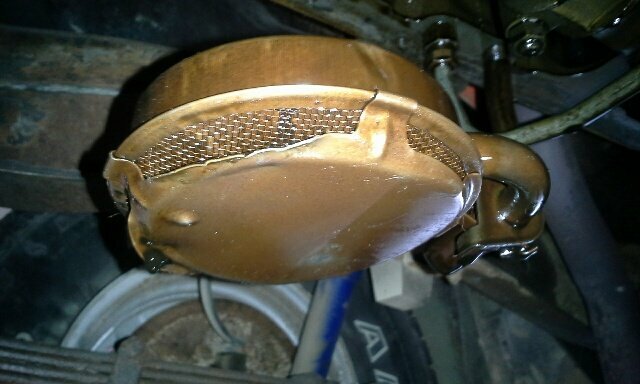 Okay some close up pics, cyl 6 has a bad rust pitted spot, that cyl might clean up with a honing, but it could very well be a boring candidate. Not as good as I was told, but would only believe after my assessment. 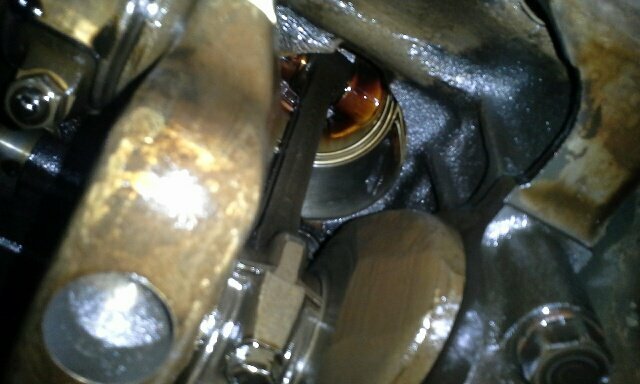 Okay so pulled the oil pan today, a slight amount of sludge, certainly no metal, all looks okay so far.